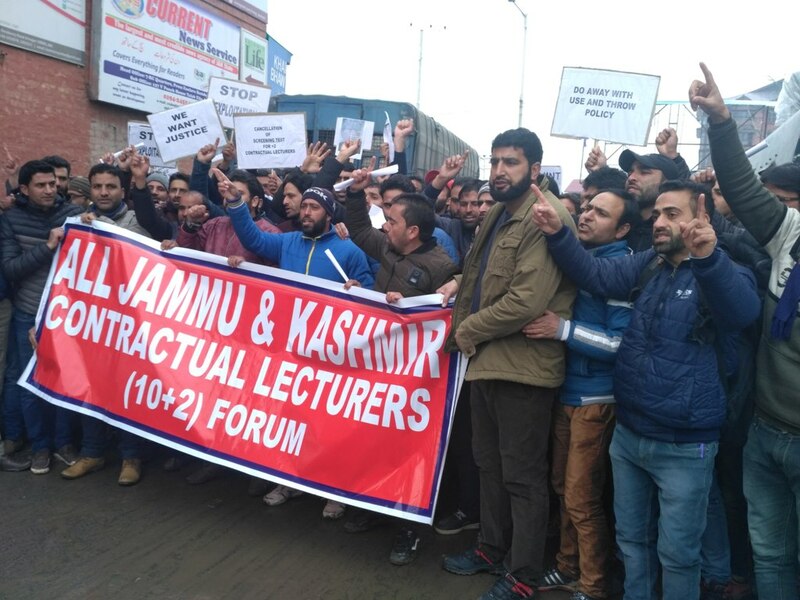 Srinagar: All J&K Contractual lecturers (10+2) Forum staged a protest demonstration at Pratap Park on Tuesday afternoon demanding the regularisation of their services. Scores of protesters shouting anti-administration slogans sought the intervention of Governor’s administration for taking their services for-granted and to fulfil their “legitimate demands”. “Our ability is being tested every year. Unlike other professions we are forced to take screening test every year and fired at the end of the session,” said Tariq Ahmad, a lecturer from district Kupwara. The forum urged the Governor Satya Pal Malik to frame SRO for their regularisation. “If SSA, RTE teachers, PHE, PDD workers can be regularised why not the highly educated lecturers. We are M.phil, PhD holders and many of us have qualified national and state entrance examination yet we work on a meagre salary of 7000 Rupees,” said Javid Ahmad Bhat, Vice President of the forum. The protestors alleged that despite directions from Advisor to Governor, Khursheed Ahmad Ganai some CEOs are again trying to issue notification for fresh selections. “We have only gained assurances from the government but nothing was done on the ground. We request the director education to continue our service,” said a protesting teacher Rihanna. The protestors threatened more agitation if their demands are not fulfilled. The contractual teachers in the Jammu division have been on a chain hunger strike at Press Club Jammu since the last 729 days.